Well I guess this almost makes it official - the rosé boom is well and truly under way. The good members of the Prosecco DOC Consorzio have decreed that a pink version of their bubbly is to be permissible. Winemakers will be allowed to mix the signature Prosecco grape, Glera, with Pinot Noir to create Prosecco rosé within the DOC. It is another recognition of the way that pink is now in throughout the world of wine. 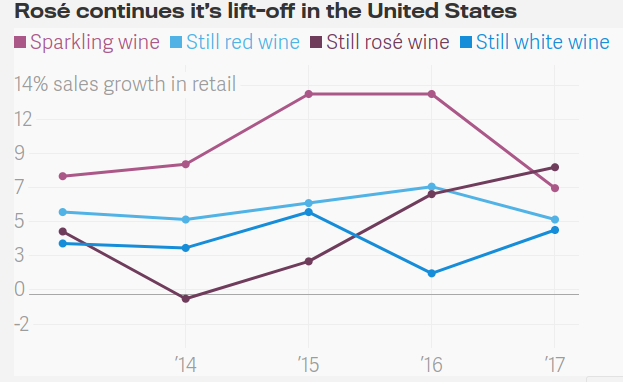 In the USA, rosé sales, which began to boom in 2014 have continued to tick up this past year. Sales have been so robust that rosé has officially kicked sparkling wine out of the top spot. Indeed, Quartz reports that, according to market research provider Euromonitor, the category that includes Champagne and other sparkling wines (non-genuine champagne, as well as cavas, lambruscos, etc.) was overtaken by rosé as the wine subcategory with the most sales in 2017.